Potatoes – growing your own is easy! 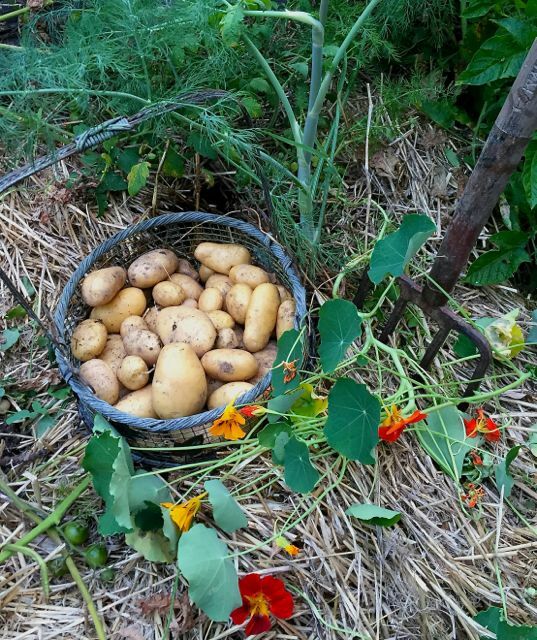 We have just been away for a couple of months and just about the last thing I did, before I left home, was plant some old potatoes in the garden that had been quietly sprouting away in my pantry – ones that you would normally chuck out. 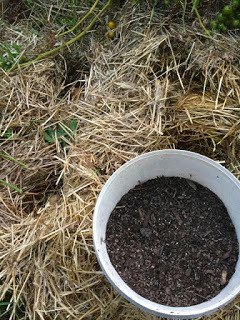 This was a quick and easy task because the second last thing I had done before my trip was to mulch the garden with a thick layer of straw to suppress the weeds, stop it drying out and provide a rich layer of organic matter to quietly feed the soil. Now, what was the first thing I was thinking about on my way back from the airport and what was the first thing I did the next day – you’ve got it – inspect the garden and dig up my beautiful potato crop – about 6kg of Dutch Creams from 3 mouldy old potatoes!! Want to find out how you can do it – read on. Potatoes are in the same family as tomatoes,eggplant, capsicum, the Solanaceae family so remember one of the rules of gardening – don’t plant anything from the same family in the same spot twice in a row – this is called rotation. Why? – because they need similar nutrients from the soil and repeat crops will fail to thrive AND particular pests of that family will build up numbers if they have successive host plants – common sense isn’t it? Technically, it is illegal in most states of Australia to grow potatoes from anything other than certified seed potatoes – this is to stop the spread of diseases, so if you live in a potato growing district follow this advice. However, people have been growing potatoes for centuries from their own potatoes – just be sensible and use healthy looking potatoes to start with. You will find that many supermarket potatoes WON’T sprout in the pantry – this is because they have been treated to stop them doing so – like sterile tomato seedlings from the hardware store. 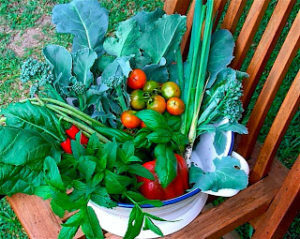 This is to stop the home gardener doing what we have always done – saving seed and regrowing another crop. (This is another capitalist trick – like printer cartridges and mobile phone paraphernalia, grrrrrr!). Fortunately, while I had been away, a few forgotten potatoes had been sprouting away in my pantry – just ready for me to plant after I had dug up the last lot. This depends on where you live, but they are pretty forgiving about most growing conditions – they just won’t thrive in the depths of winter, so if you get frost plant when the last frost is over. Our summers, up here near the Queensland border, are way too hot and wet for potato growing during the summer months and they are generally grown as an autumn/winter/spring crop – and I usually get in at least two crops a year because they only take from 60-90 days from planting to harvesting. However, I have just been visiting my mother in Suffolk,UK and fields of more temperate summer grown potatoes were being harvested everywhere – their winters being just too cold for the spud. 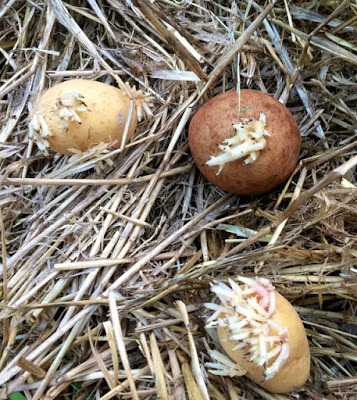 The potato is a tuber – a root crop, and the developing potatoes grow off the stem and need to be grown in deep soil because any near the surface will turn green and these are poisonous. Potatoes are heavy feeders with a pH below 6 (slightly acid) – so don’t add lime. They will not grow in heavy clay and like a friable, rich soil. I just use compost with a handul of pelleted chook poo. Heres how I do it – it’s really simple! 1. 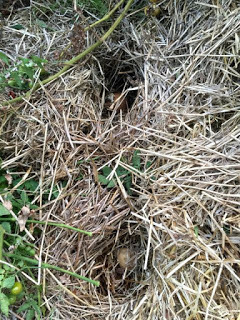 Prepare a bed of straw/grass clippings/composted weeds THAT IS IN FULL SUN. 2. 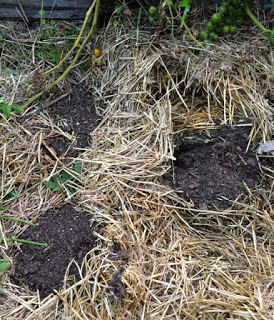 Make a hole about as deep as your elbow to your hand – this is gardeners measurement! 3. Place the ‘chitted’ potato in the bottom of the hole – this is what a potato is called when it has sprouted. NOTE: You can grow potatoes in just about any container that has drainage holes and is LARGE ENOUGH e.g. old garbage bins with holes in the bottom, free-form piece of wire mesh made into a circle, hessian sacks. I am not a fan of the rubber tyre potato stack – I worry about the chemicals from the tyres. 4. Get some well rotted compost and add a handful of organic fertiliser. I use Organic Life – which is mostly chook poo but has other things added to ensure that all the major and micro nutrients are present. You will not need to feed this crop again after that. 6. Be generous in filling your potato holes with soil because the size of your potato crop is directly related to the quality and amount of soil that they have grown in. 7. Give the ground a good water and then just don’t worry about it for about two months. 8. You will know when the potatoes are ready to harvest because the green plant, that has shot out of the potato above the ground, will begin to die-down and wilt. 9. This is the fun part – digging up potatoes, like jewels from Aladdin’s cave – was what first turned me on to gardening when I was a child and helping my dad on his allotment. Now who has been paying attention? Explain the terms rotation, chitting and flocculate? want to encourage one to continue your great posts, have a nice holiday weekend!